Hank Hunter, who wrote a number of hits in the late-50's and early-60's, died on November 4 at the age of 88. 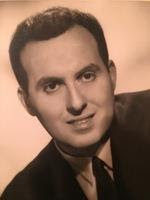 Hunter was born Henry Hadad, Jr. in 1929 in Brooklyn and originally worked in his father's business after graduating from New York University but, in the mid-50's, he made the decision to try to be a songwriter. Working out of the Brill Building, he wrote with the likes of Neil Sedaka, Barry Mann, Al Kasha, Phil Spector and many others. Hunter left the writing business in the mid-60's but had success periodically when new versions of his songs were recorded. He is survived by his wive of 53 years, Claudette, two children and four grandchildren.